Infrared spectrum of the protostar AFGL 2591 made by the EXES instrument on SOFIA, superimposed on an infrared image of the protostar and the nebula that surrounds it, made by the Gemini Observatory. Credits: Spectrum Image: NASA/DLR/USRA/DSI/EXES Team/N. Indrolio (U. Michigan & JHU); Credit Background Image: C. Aspin et al. / NIRI / Gemini Observatory / NSF. A team of scientists using the Stratospheric Observatory for Infrared Astronomy (SOFIA) has pinpointed the amount and location of water vapor around a newly forming star with groundbreaking precision. Using data collected aboard SOFIA, the team determined that most of this young star’s water vapor is located in material flowing away from the star, rather than within the disk of matter orbiting around it. This location is unexpected, indicating that if planets formed around this star, they might receive only a small fraction of the water in the system. These observations were made possible by using SOFIA’s airborne vantage point in the Stratosphere — at an altitude above 99% of Earth’s water vapor, which prevents this type of measurement from the ground– as well as the precision and sensitivity of the EXES (Echelon-Cross-Echelle Spectrograph) instrument aboard SOFIA. The instrument spreads infrared light into its component colors with very high detail, providing scientists with more information about this light than was previously possible. For the next eight weeks, the aircraft-based observatory will operate from the U.S. National Science Foundation’s Antarctic Program facility at Christchurch International Airport. The airborne platform puts the observatory above 99% of Earth’s infrared-blocking water vapor, and enables it to conduct observations from almost anywhere in the world. When flying from New Zealand, astronomers on board SOFIA can study celestial objects that are best observed from southern latitudes, such as star formation within the Magellanic Clouds. The Magellanic Clouds are two satellite galaxies of our Milky Way Galaxy. From the aircraft’s home base in California, scientists on SOFIA typically study star formation within the Milky Way, but flying in the Southern Hemisphere gives scientists a view of star formation within these neighboring galaxies. Comparing stellar evolution in the Magellanic Clouds and the Milky Way enables scientists to better understand how the earliest generations of stars in our universe formed. 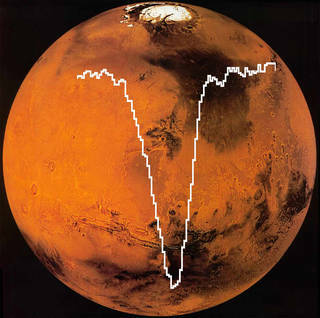 The Viking and Mariner missions of the 1970s made the last measurements of atomic oxygen in the Martian atmosphere. These more recent observations were possible thanks to SOFIA’s airborne location, flying between 37,000-45,000 feet, above most of the infrared-blocking moisture in Earth’s atmosphere. The advanced detectors on one of the observatory’s instruments, the German Receiver for Astronomy at Terahertz Frequencies (GREAT), enabled astronomers to distinguish the oxygen in the Martian atmosphere from oxygen in Earth’s atmosphere. Researchers presented their findings in a paper* published in the journal Astronomy and Astrophysics in 2015. SOFIA Science Center, NASA’s Ames Research Center, Moffett Field, Calif. The newest instrument, an infrared camera called the High-resolution Airborne Wideband Camera-Plus (HAWC+), was installed on the Stratospheric Observatory for Infrared Astronomy, SOFIA, this week. This is the only currently operating astronomical camera that makes images using far-infrared light, allowing studies of low-temperature early stages of star and planet formation. HAWC+ includes a polarimeter, a device that measures the alignment of incoming light waves. With the polarimeter, HAWC+ can map magnetic fields in star forming regions and in the environment around the supermassive black hole at the center of the Milky Way galaxy. These new maps can reveal how the strength and direction of magnetic fields affect the rate at which interstellar clouds condense to form new stars. A team led by C. Darren Dowell at NASA’s Jet Propulsion Laboratory and including participants from more than a dozen institutions developed the instrument. Our flying observatory, called SOFIA, is the world’s largest airborne observatory. It is a partnership with the German Aerospace Center (DLR). SOFIA studies the life cycle of stars, planets (including Pluto’s atmosphere), how interstellar dust can contribute to planet formation, analyzes the area around black holes, and identifies complex molecules in space. SOFIA stands for the Stratospheric Observatory for Infrared Astronomy. It is a Boeing 747SP aircraft that carries a 100-inch telescope to observe the universe while flying between 38,000 and 45,000 feet – the layer of Earth’s atmosphere called the stratosphere. SP stands for “special performance.” The plane is 47 feet shorter than a standard 747, so it’s lighter and can fly greater distances. Each observing flight lasts 10-12 hours. The telescope is behind a door that opens when SOFIA reaches altitude so astronomers on board can study the universe. The kind of light SOFIA observes, infrared, is blocked by almost all materials, so engineers designed the side of the aircraft to direct air up-and-over the open cavity, ensuring a smooth flight. 4. …But the Cabin is Pressurized! A wall, called a pressure bulkhead, was added between the telescope and the cabin so the team inside the aircraft stays comfortable and safe. Each flight has pilots, telescope operators, scientists, flight planners and mission crew aboard. Water vapor in Earth’s atmosphere blocks infrared light from reaching the ground. Flying at more than 39,000 feet puts SOFIA above more than 99% of this vapor, allowing astronomers to study infrared light coming from space. The airborne observatory can carry heavier, more powerful instruments than space-based observatories because it is not limited by launch weight restrictions and solar power. Humans cannot see what is beyond the rainbow of visible light. However, many interesting astronomical processes happen in the clouds of dust and gas that often surround the objects SOFIA studies, like newly forming stars. Infrared light can pass through these clouds, allowing astronomers to study what is happening inside these areas. The telescope was built our partner, the German Aerospace Center, DLR. It is made of a glass-ceramic material called Zerodur that does not change shape when exposed to extremely cold temperatures. The telescope has a honeycomb design, which reduces the weight by 80%, from 8,700 lb to 1,764 lb. (Note that the honeycomb design was only visible before the reflective aluminum coating was applied to the mirror’s surface). The telescope can move up and down, between 20-60 degrees above the horizon. But it can only move significantly left and right by turning the whole aircraft. Each new direction of the flight means astronomers are studying a new celestial object. SOFIA’s flight planners carefully map where the plane needs to fly to best observe each object planned for that night. The observations for these findings were gathered with the FORCAST instrument on SOFIA, the Faint Object infraRed CAmera for the SOFIA Telescope, which can gather images and spectra of planets, stars, interstellar clouds and galaxies at mid-infrared wavelengths. 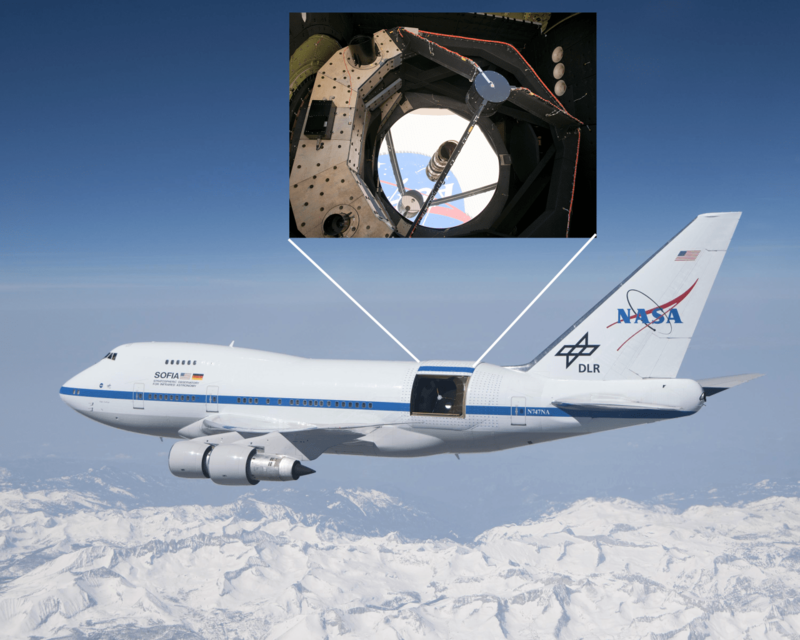 NASA’s “flying” telescope, the Stratospheric Observatory for Infrared Astronomy (SOFIA) aboard a highly modified Boeing 747SP jetliner, began its fourth series of science flights on Feb. 3, 2016. SOFIA’s instruments observe infrared energy – one part of the electromagnetic spectrum, which includes visible light, x-rays, radio waves and others. 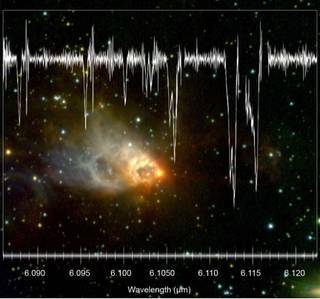 Many objects in space, for example newborn stars, emit almost all their energy at infrared wavelengths and are undetectable when observed in ordinary visible light. In other cases, clouds of gas and dust in space block visible light objects but allow infrared energy to reach Earth. 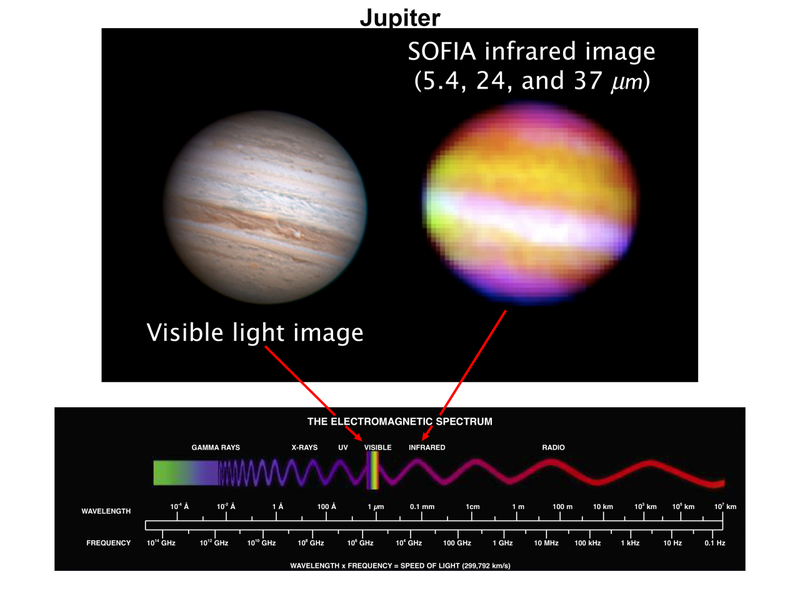 In both situations, the celestial objects of interest can only be studied using infrared facilities like SOFIA. Scientists from the University of Georgia, University of Arizona, University of Texas at San Antonio, and the Space Telescope Science Institute in Baltimore, plus their collaborators from institutions in the United States and Europe, obtained data using the Faint Object Infrared Camera for the SOFIA Telescope (FORCAST) mounted on SOFIA’s telescope for imaging and spectroscopic observations during the flight. The far-infrared High-resolution Airborne Wideband Camera-plus (HAWC+) will be added to SOFIA’s suite of seven cameras, spectrometers, and high-speed photometers during the latter part of Cycle 4. HAWC+’s optics, state-of-the art detector arrays, and upgradability will permit a broad range of important astrophysical investigations, including the unique and powerful capability of mapping magnetic fields in molecular clouds. 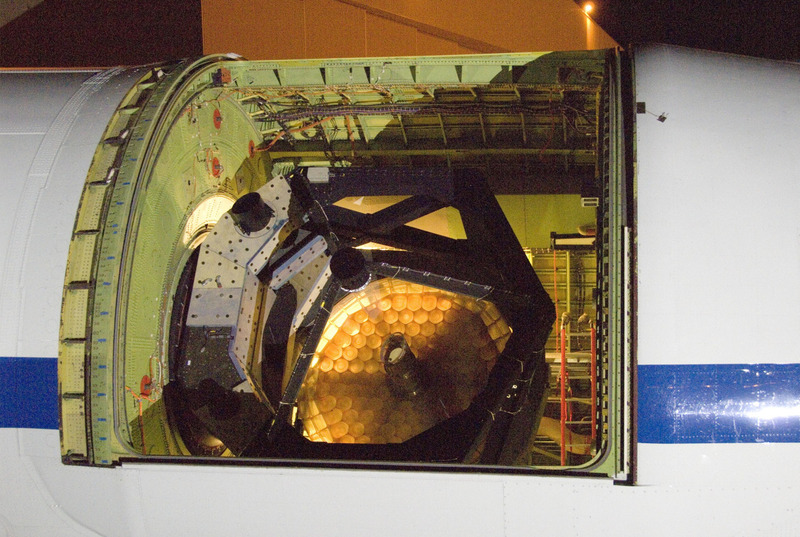 The Stratospheric Observatory for Infrared Astronomy (SOFIA) mission is responsible to NASA for conducting an Education and Public Outreach program that exploits the unique attributes of airborne astronomy to contribute to national goals for the reform of science, technology, engineering, and math (STEM) education, and to the elevation of public scientific and technical literacy. SOFIA’s Airborne Astronomy Ambassadors (AAA) effort is a professional development program aspiring to improve teaching, inspire students, and inform the community. It builds upon the legacy of NASA’s highly successful FOSTER (Flight Opportunities for Science Teacher EnRicment) program that flew educators aboard the Kuiper Airborne Observatory (KAO) from 1990 – 1995. SOFIA’s AAA program now enters its Cycle 2 phase: 12 AAA educator teams representing educators from 10 states were selected. For the Cycle 1 phase of SOFIA’s AAA program, 13 AAA educator teams plus alternates were selected in a highly competitive application process. Selected educators came from a variety of backgrounds, and their institutions included a school for the deaf, an alternative education site (developmentally challenged), highly underserved student populations, rural schools, and a Native American school site. The Airborne Astronomy Ambassadors “Pilot” program for educator professional development successfully flew six teachers on the observatory during the summer of 2011, representing California, Wisconsin, Michigan, Illinois, and Virginia (Washington DC). Evaluation confirmed the program’s positive impact on the teacher participants, on their students, and in their communities. Teachers not only incorporated content knowledge and specific components of their experience into their curricula, they also have also given dozens of presentations and implemented teacher professional development workshops. Their efforts to date have impacted thousands of students and teachers. As part of preparation and training for their flight experience, AAA program participants complete a graduate-level Astronomy for Teachers on-line course administered by Montana State University and National Teacher Enhancement Network. Teams are paired with an astronomer with observatory time, and they work with this astronomer throughout the research, from preparation to data analysis. AAAs optimally fly aboard the observatory twice, will implement classroom lessons based on their experiences, and will complete an outreach plan. Selection into this prestigious program is truly an honor for the educators and their school, planetarium, or observatory. NASA’s Stratospheric Observatory for Infrared Astronomy, SOFIA, departed from Christchurch, New Zealand at 6:20 pm local time June 19 for the first of 15 planned Southern Hemisphere deployment science flights. During this deployment, five cameras and spectrographs will be used: the Faint Object infraRed CAmera for the SOFIA Telescope (FORCAST) and the German REceiver for Astronomy at Terahertz Frequencies (GREAT) for a total of 15 flights, plus the First Light Infrared TEst CAMera (FLITECAM), the High Speed Imaging Photometer for Occultations (HIPO), and the Focal Plane Imager (FPI) in ensemble during one flight to observe a stellar occultation by Pluto. Observing from the Southern Hemisphere also enables SOFIA to view the Magellanic Clouds, two satellite galaxies of the Milky Way Galaxy that have had fewer generations of stars, and therefore contain smaller proportions of heavy elements, than our own galaxy. Comparing star formation and stellar evolution in the Magellanic Clouds versus the Milky Way can help refine an understanding of how the earliest generations of stars in the Universe formed from gas containing little or no heavy elements. FLIPO and the FPI are expected to observe Pluto as it passes in front of a background star on June 29. That occultation event is fortuitously soon before the New Horizons spacecraft’s closest approach to Pluto on July 14. The near-coincidence of observations by SOFIA and New Horizons could provide investigators with a singular opportunity to link the fly-by spacecraft’s “snap shot” measurements with an ongoing Earth-based research program monitoring long-term changes in Pluto’s atmosphere. SOFIA is scheduled to return to the United States on July 24. SOFIA is a joint project of NASA and the German Aerospace Center. The aircraft is based at NASA’s Armstrong Flight Research Center facility in Palmdale, California. NASA’s Ames Research Center in Moffett Field, California is home to the SOFIA Science Center that is managed by NASA in cooperation with the Universities Space Research Association headquartered in Columbia, Maryland, and the German SOFIA Institute at the University of Stuttgart.